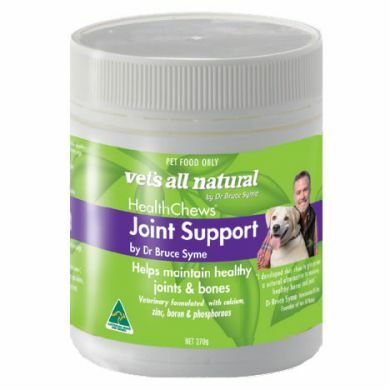 Vets All Joint Support HealthChews are a tasty nutritional supplement to assist in maintaining healthy bones and joints. It is ideal for supporting dogs that are active, large breed, older or recovering from injury. Joint Support HealthChews include kangaroo, liver, calcium, dominate, ginger, copper, flax meal, whole herbs. 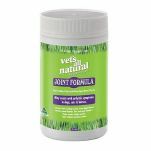 Read 2 customer reviews of Vets All Natural Joint Support HealthChews. The average customer rating is 4.5. I have a Cocker that has had both cruciate ligaments done, so I 've given her one of these each night for past 8 years. At 11.5 years, she's still active with no arthritis in the joints. I bought these for my 9 year old German Sheppherd as he was having hip problems, especially when the weather was cold. After approximately 2 weeks of giving him the All Natural Joint Support Health Chews with his dinner he is able to stand up a lot easier and is enjoying his daily run more. I'm hoping he continues to improve.